In any business, it is important to know how much your email list is worth. Especially if you have a blog and rely on subscribers to make income. And to really know what our email list is worth we need to break it down to each individual subscriber and look at much they are worth. Knowing your subscriber value is the key to being able to estimate your direct income from your list and is an important metric for email building. It’s even more important than your opt-in rate and your unsubscribe rate. To make this really clear, the reason why it’s so important is because I’m assuming you’re not just growing a business as a hobby, but you’re actually trying to make money from it, right? And in order to make money, it’s important to understand the different actions it takes for an email to turn into a purchase. Lucky for us, we can break these steps down into metrics to help us calculate how much our email list is worth with the Click Through Rate (CTR) and the Conversion Rate (CR). The first step is to find out what is the average click through rate you should aim for. Although it’s a little difficult to gauge since many sources say different things. It also depends greatly on the industry in which you are in. For example, according to Mailchimp, email marketing and advertising has an open rate of 16.48% and a click through rate of only of 1.74%. That means if you send out 1000 emails, 165 will be opened and your link will be clicked by 17 people. But as you can see here in Mailchimp’s chart updated in March 2018, these numbers change drastically from industry to industry. Send emails frequently (at least once per week) so that your list stays up to date. You can always use this CTR calculator as well if you are unsure of your numbers. Your sales conversion rate is an excellent way of tracking the effectiveness of your messaging as well as the product behind the message. In other words, it is the actual percentage of people that gave their email in exchange for your lead magnet or the number of people who made purchases in exchange for your product. If you send an email to 100 people and 10 people buy your product, then you have a conversion rate of %10. And if you have trouble with calculations, there are softwares that can help you out with this like Google Analytics. And like the CTR, there isn’t a perfect percentage to aim for your conversion rate. It varies from industry to industry. 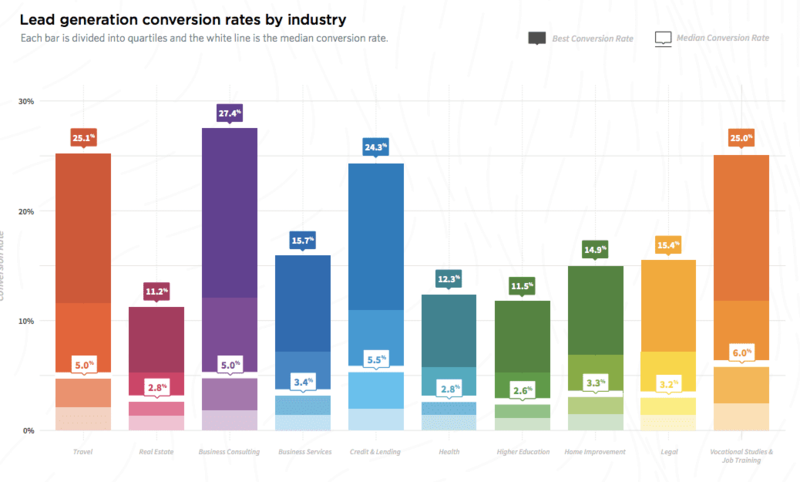 Here is a chart of the average conversion rates in different industries by Smart Insights. So How Do We Really Know What Our Subscribers Are Worth? 1. Go see how many subscribers you currently have. This seems simple and straightforward but consider skimming through your list and shedding a layer. Check out how many have been inactive for 6 months or longer. When I say inactive, I mean the ones who haven’t opened or clicked any of your emails. Now, throw them out. Don’t be disappointed if you end up losing more than you thought because you can always create a project to get them back. But more importantly, think of ways to get emails from new people on your list. After you’ve done your cleanup, you can now use the current number to calculate how much your email list is worth. Calculate your direct revenue from over the last year. The reason I suggest calculating the revenue from the last year instead of the lifetime value is because it’s possible that your business hasn’t been up and running or making very much income for 3 years already. And it’s possible that you haven’t even been actively selling or tracking your income. If you have, feel free to use the last three years in your calculations. If not, using the last year will give you a much better/accurate calculation. How much revenue you’ve made directly from your list. How much revenue you’ve made indirectly from your list. What I mean by “directly” is the income you’ve made from people opening the email, clicking the link, entering their payment info and buying something. Those are profits you made from sending the email. Indirect is income from everything else not email related and should be put aside while making this calculation. Now that we’ve got our number of subscribers and last years income that we’ve made as direct revenue from our email list, let’s do the math. Last year’s income was $10,000 strictly from direct income. SO, in this case your subscriber value would be 25 cents per subscriber. And your email list would be worth $10,000. This isn’t for everybody and only for people who want to calculate every aspect of their email list value. Most online entrepreneurs don’t calculate their time as expenses into their business. But if you’re somebody who does, then this parts for you! And we must not forget about our overhead costs for email production and our time writing these emails. This means the time that it took you to write and fabricate the email, as well as how much you pay for your email service provider. Depending on the kind of emails you send, it’s easy to work up to 3 hours for one weekly email. That’s a good chunk of time. Email service provider – $40 per month = $480 per year. Your time – 2 hours per week. Let’s choose a random amount and say our time value is $80 per hour. Cost per week = $160. Cost per month = $640. Cost per year $7,680. $1,540/2,500 (number of subscribers) = 0.61 cents subscriber value. Whoooh.. Go take a break. You deserve it. That was a lot of thinking and math. What do you make each day? How many hours do you work? Let’s say you make $200 per day and you work 8 hours per day. Check out this time value calculator to see what your time value equals. Now that you have your subscriber value, you can go ahead and add this number to whatever analytics software you are using. You can incorporate a dolar value to your goal. And now, you can also use your subscriber value to measure list building tactics. Let’s say you are running Facebook Ads and paying 30 cents per new subscriber. Wow! This is half of your subscriber value, which means more money for you… At least it seems that way. But remember to always consider your overhead costs, specifically your time value. How much time are you spending managing these Facebook Ads? Some of us, and I must admit guilt to this too, spend at least an hour per day just looking over accounts and ditzing around. That means if your time is worth $80/hour, you are spending that amount an hour per day. Where you really need to be careful is the number of subscribers you are gaining per day from these Ads. If you’re only getting 10 new subscribers, with time costs and other overhead costs involved, you are now spending $8 per subscriber, not 30 cents. $80 (time value per hour)/10 (subscribers per day) = $8 paid for each subscriber. To lessen this amount, stick to just doing the necessary things and use your time wisely! No ditzing around. There are so many components that go into the calculation of your subscriber value and once you’ve got the magic number, you can really gage your list building tactics and how much money you’re allowed to spend in order to make a profit. It can also make you realize how important having an email list is and how to manage it properly. Just remember that your time does cost money, possibly quite a lot of money, too. So be careful with it and use it wisely.